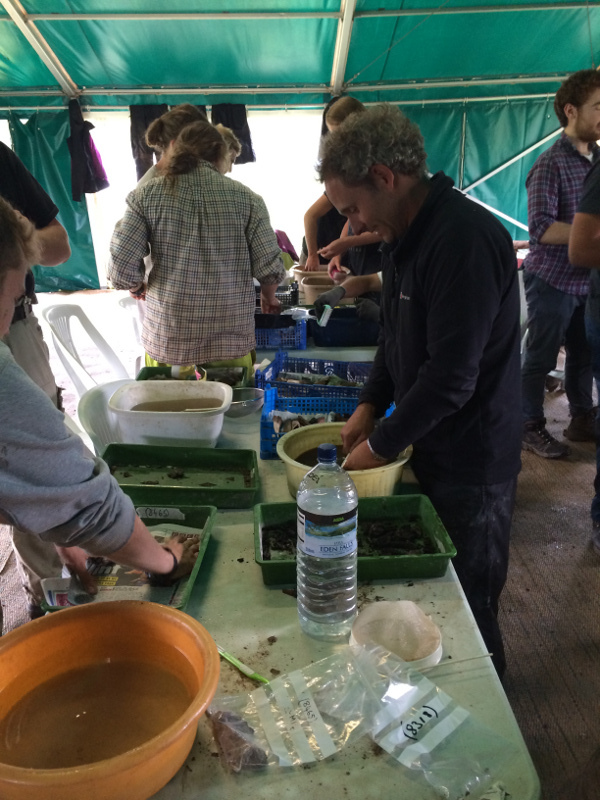 We’re well into the final week of the dig now, and it’s been a bit of an odd week! 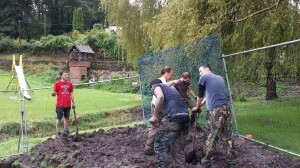 For the first time in our six years digging in Lyminge we were rained off for two consecutive days on Monday and Tuesday as it was far too wet and dangerous to walk on site and the archaeology would have been damaged. We’ve been incredibly lucky in previous seasons only to lose the odd day. Instead of digging, we redeployed students onto finds washing in the campsite marquee which was large enough for the whole team, and everyone got stuck in! Gabor proves he’s a hands-on director! Even our esteemed director was to be found finds processing, toothbrush in hand! 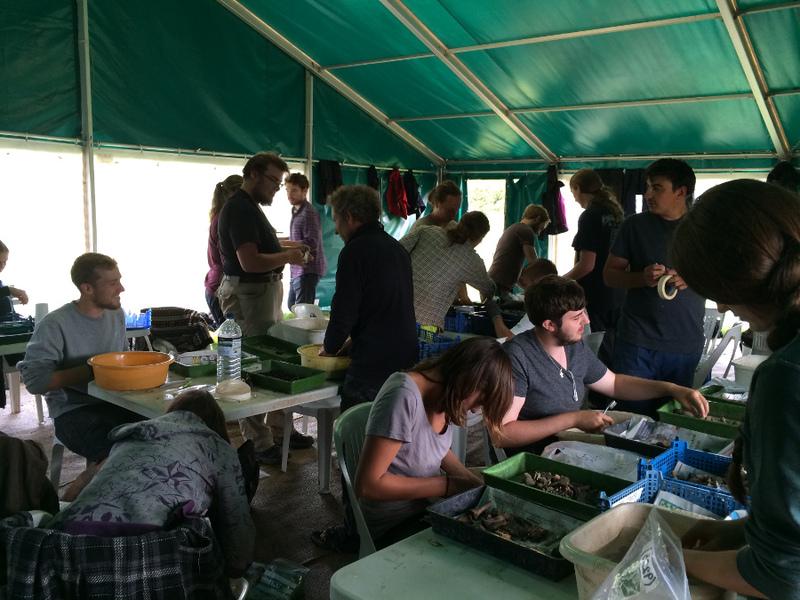 Nailbourne which was so productive with waterlogged finds at the beginning of the dig. This was going to be a wet and muddy task whether rain or shine, so while digging couldn’t continue, the hole was backfilled. 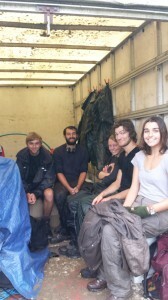 Of course, it hasn’t all been wet and miserable, as the first photo in this post attests! Digging has still continued apace in the rest of the week, with quite a depth being reached in the major north-south slot through the midden, and a great many more post holes excavated in the post-built structure that is just west of the midden. We’re excited to be able to start to disentangle the post holes that form several phases of a timber hall in this western area of trench 1. While this area is still incredible complicated, you should be able to see rectangular arrangements of post holes in the photo below. It looks like we have several phases, with timber post-built structures replacing each other. At this stage we can’t be sure how many phases are here, but there may be as many as 3 or even 4, particularly as we have evidence for 3 pairs of substantial post-pits at the doorway on the northen side of the structure. One of the phases is made up of paired post holes, a form seen elsewhere in Anglo-Saxon England. 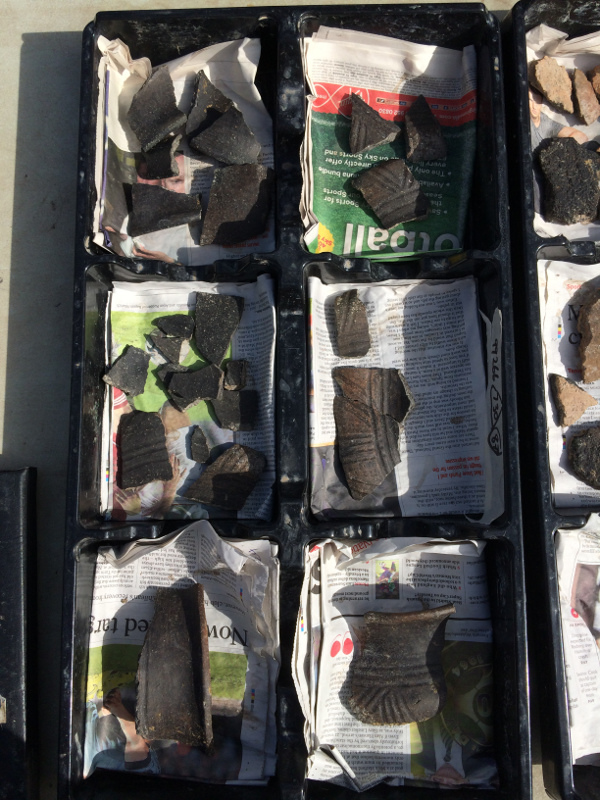 We are also thrilled to have artefact evidence in the post holes themselves, with pottery suggesting a date of the 6th century (we can’t be any more specific at the moment) and even copper alloy objects associated with the structure. 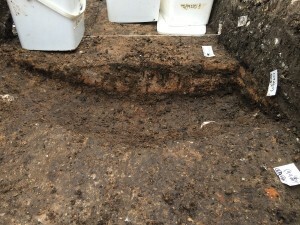 What is extremely interesting is that we have at last got evidence for the buildings that might have been lived and worked in by those who used the sunken-featured buildings excavated in previous seasons. The feasting halls excavated since 2012 are on a grand scale, and post-date the sunken-featured buildings, being 7th century AD in date. 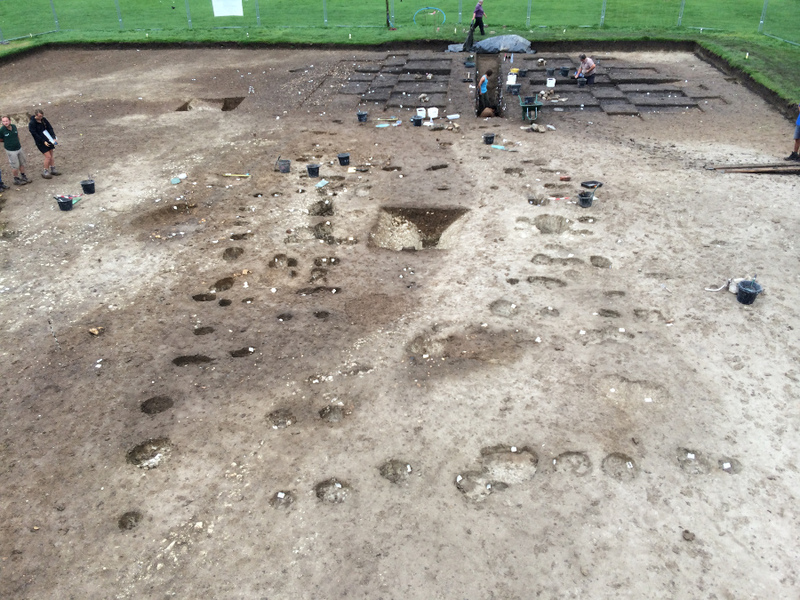 One was even cut right through by three different Timber Hall phases, excavated in 2013. SFBs are unlikely to have been used as dwellings, rather for craft working or as storage buildings, and it seems that we have last discovered one of these more modest (if only compared with our feasting halls!) 6th century post-built halls. Something particularly curious this season is the proliferation of pins from the 6th century areas including the post-built halls. Last week we were pleased host a visit from the Sutton Hoo Society, along with Dr Helen Geake, one of their members and an expert in Early Medieval artefacts. 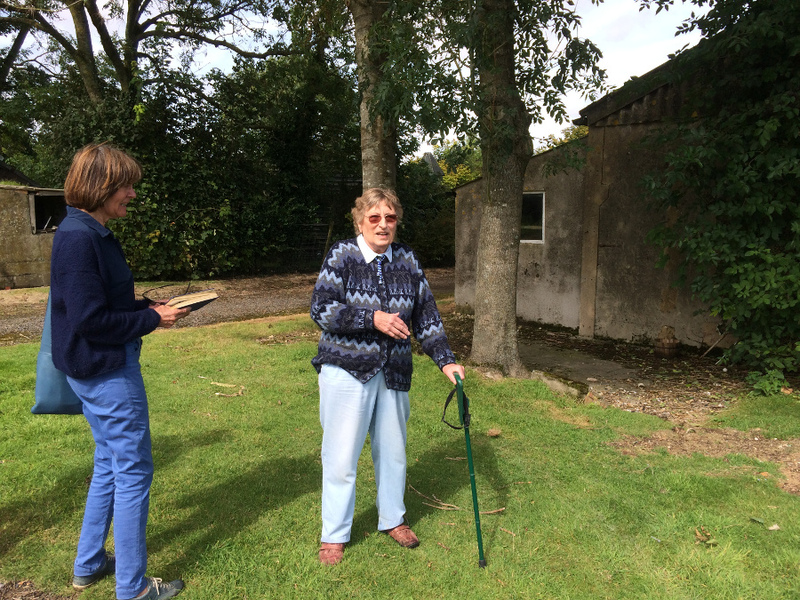 Helen was present as one of our volunteers, Pip Patrick, unearthed a very delicate bronze pin from a post hole in one of the post-built halls. It seems from excavation that the pin might have been placed in the post hole after demolition. 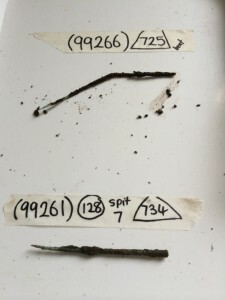 Along with this lovely find, three further long, thin bronze pins have also been excavated from the midden/metalworking area, extremely interesting as they are all long and rather delicate. The midden area where the three bronze pins above are from is revealing it’s secrets to us slowly but surely. Some of the finds coming from this area are truly exceptional, even if they might not be decorative or especially beautiful. Since we excavated the hearth, slag and furnace material has been coming up in ever increasing quantities, so much so that we invited Jeremy Hodgkinson of the Wealdon Iron Research Group to have a look and give us his opinion on whether he thought we had an iron working area. Jeremy has confirmed what we suspected – that both smelting and smithing slag is present within the layers through the midden, and that the large areas of burning, fired clay, charcoal and furnace material are highly likely to be dumps from used iron smelthing and smithing. He suggested that assuming our slot through the ‘blob’ area is in the right place, we may come across in situ furnaces. Certainly the broken up furnace lining that we have won’t have been transported very far. These possibilities are exciting as we head towards the bottom of the hollow or pit that is filled with the metalworking material. Much progress has been made since I showed you the hearth in the last post. 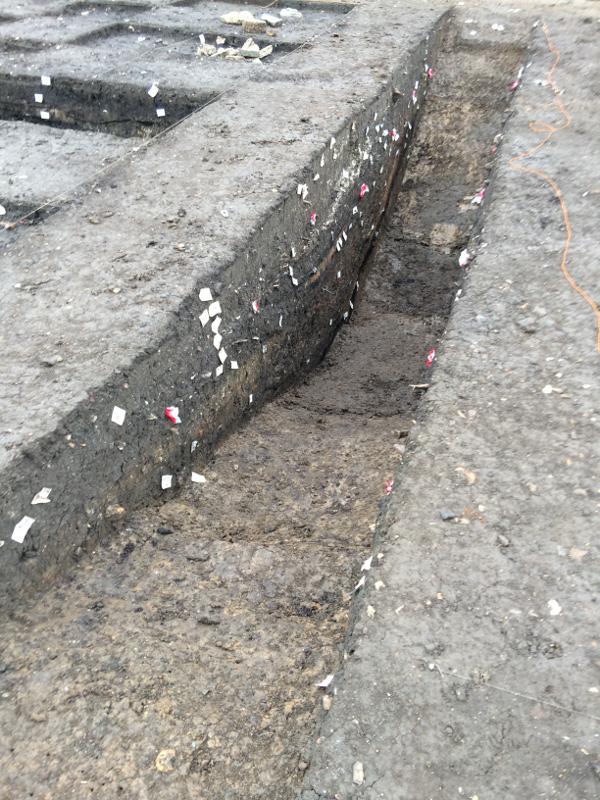 The slot through the midden area in progress – still not bottomed in this photo! In the photo above you should be able to make out thick black lines of charcoal and orange layers which are made up of almost pure fired clay raked out from furnaces or hearths and tipped in to the hollow. In the very centre of the section is a small area of orange and black horizontal stripes, which is the hearth I wrote about in the previous post. We’re coming on to the very bottom layers at the moment and it looks like the earliest layers of the pit might be prehistoric – I hope to bring you confirmation of that soon. We’re quite glad we’re nearly there! While we are getting closer to understanding the purpose of this highly unusual early Saxon midden pit, we certainly haven’t stopped finding things unrelated to metalworking. 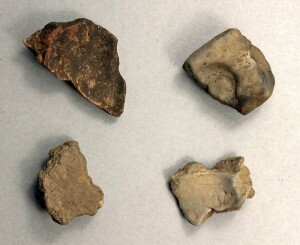 Animal bone and pottery are the most abundant, but overall the finds from the midden are exceptional, even though there are some notable exceptions such as the lack of any textile working objects. 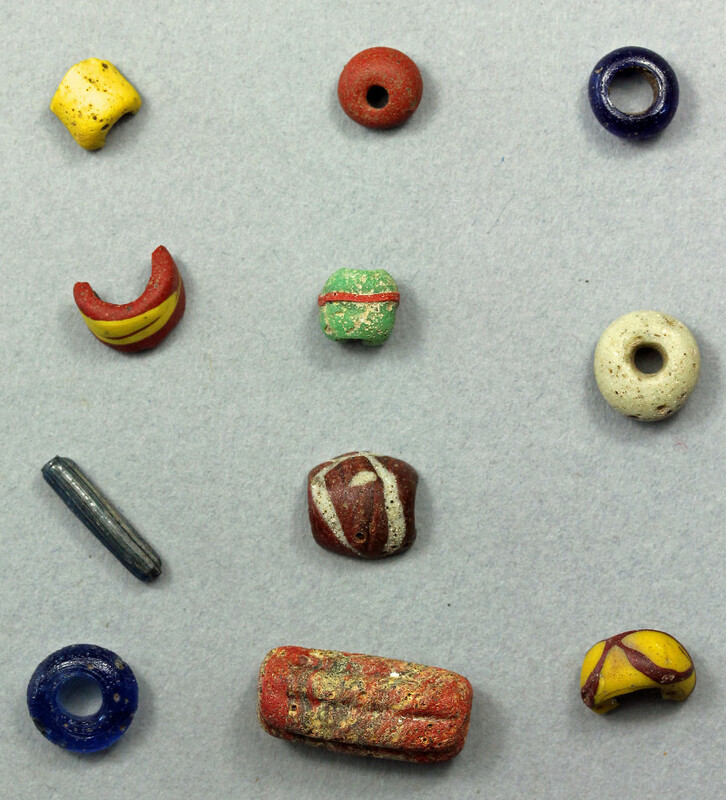 The glass beads above are a wonderful insight into a world full of colour at Lyminge – it’s very easy to forget about colour when you spend all season describing different shades of brown! The glass is also still incredibly abundant, with over 300 fragments collected this season alone at Lyminge. 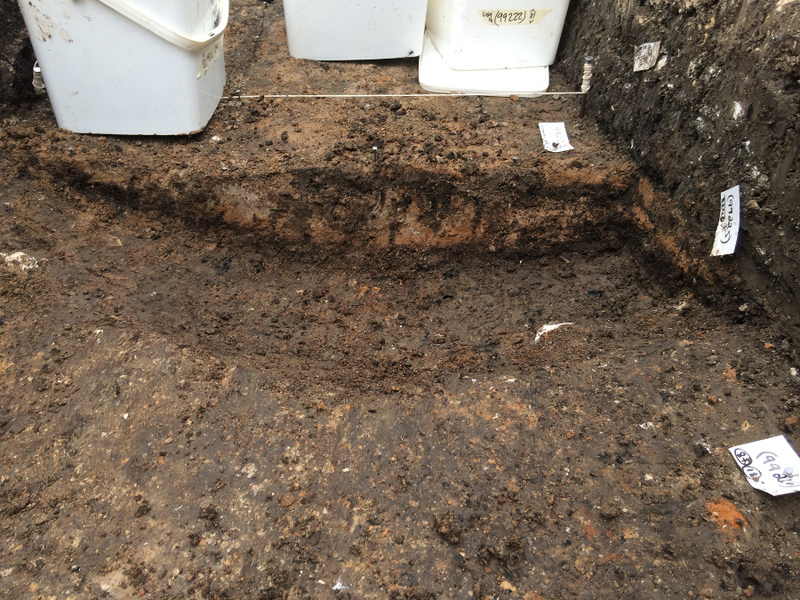 We are also starting to see lots of early pottery from the lower layers of the midden, and it’s looking extremely early, possibly even 5th Century in date. 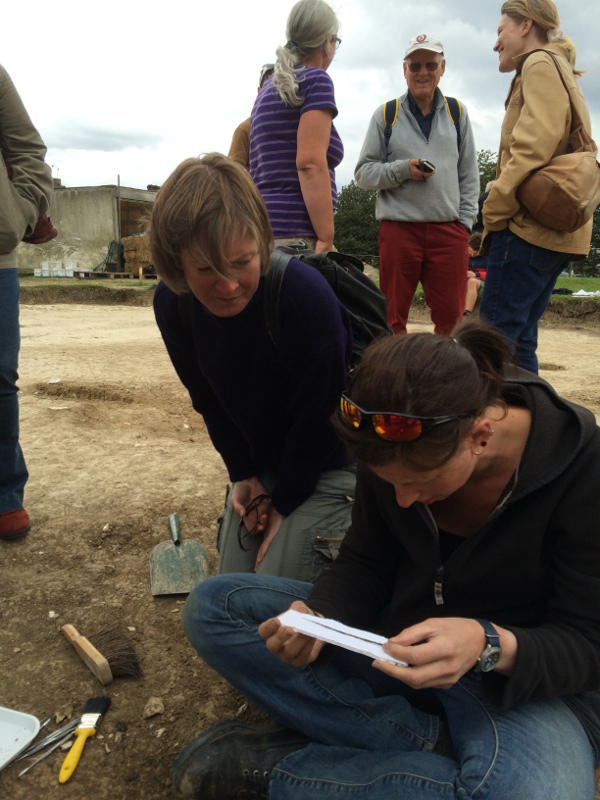 Considering these early finds, we were delighted to recieve a visit from Dr Audrey Meaney and Dr Catherine Hills, both distinguished lecturers and scholars in Anglo-Saxon archaeology. 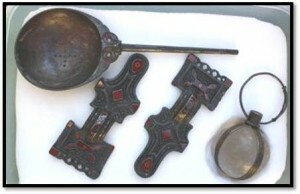 Audrey’s contribution to Anglo-Saxon archaeology is the foundation for many current studies of Anglo-Saxon paganism and worldviews. Audrey took part in the 1955 season of excavations of the Lyminge cemetery just before she started her PhD. The wonderful finds from the Lyminge cemetery are held at Maidstone Museum and are on permanent display. 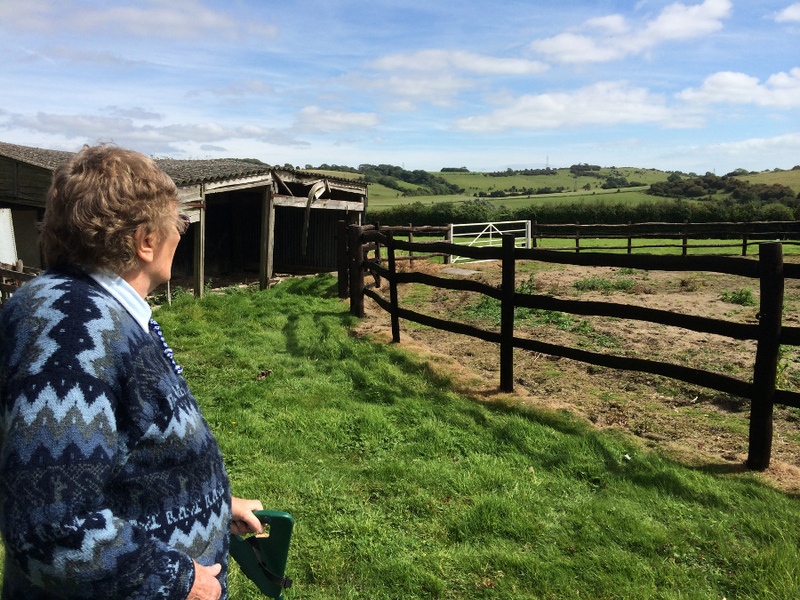 I took Catherine and Audrey up just north of Lyminge to find the spot where the excavations had taken place. excavation experiences and get a bit more information on the season of excavations at the cemetery that sadly remains unpublished. The publication of the 1954 season is available online here, with photos of the artefacts if you are unable to get to Maidstone Museum. 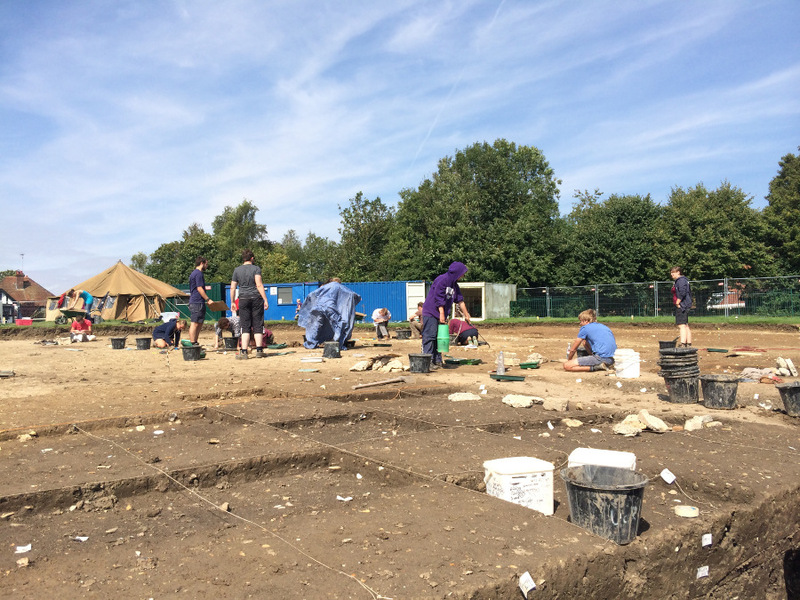 We have only a few days left before the dig comes to an end, although as per usual several of us will stay on to get the last jobs done in the coming week. You will have seen from this blog post that there is still quite a lot to finish up! 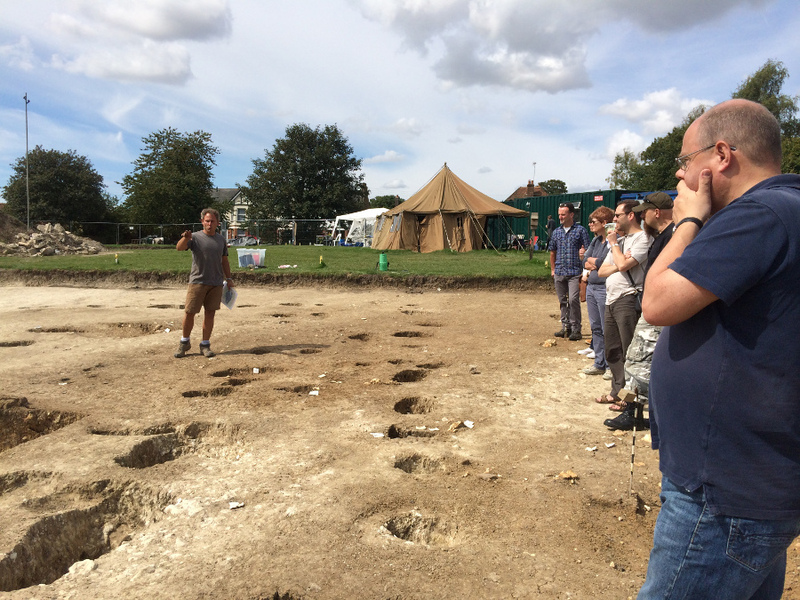 The very last site tour is on Saturday at 2pm, and Gabor will be giving an end of dig lecture tomorrow at 7pm in the Methodist Church to the Lyminge Historical Society which all are welcome to attend (unless it’s full!). I will of course be posting at least once more to wrap up the season, and don’t worry, I haven’t forgotten trench 2 and the major 7th century Timber Hall! I will continue to post throughout the last year of this phase of the project so you can see what we uncover when everything is back in the lab.